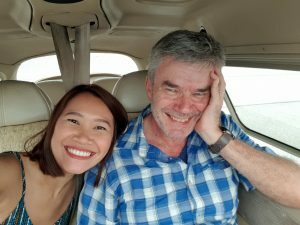 It was my third and last landing in the Cirrus SR20; fly the descent; hold the plane level and let her sink to the runway; raise the nose in the flare and let her settle gently onto a wet runway under a darkening sky. “Now you’re just showing off” said Todd from the right seat. It is moments like that which will always bring me back for more. That was the fourth day of flying in a row….so let’s start at the beginning. Tai and I had arrive in Los Angeles on 16 August from Bangkok via Manila. It was a long flight. Within hours of landing I was starting to feel the symptoms of flu. We made it over to Orlando on the 17th; but I barely left the hotel over the next three nights. A trip to the adjacent pharmacy was my Orlando excitement. On Sunday 20th we drove over to Sarasota; Monday and Tuesday were both bad. For me the simple question was would I go to work feeling that bad? If the answer is no then there is no way that I can fly. So it was Wednesday before I could start the week back at Cirrus. 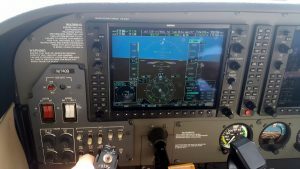 There have been some changes; a new chief pilot; Dave Armbrust is now focusing in instructing; a new ALSim flight simulator; a new (as in new to Cirrus) Seneca3 twin; and no more 32Romeo. Some new instructors; maybe too many for low season. 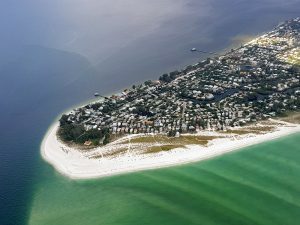 So out with Dave Armbrurst in the morning in N171RA to the practice area to remember how to fly – some slow flight, power on and power off stalls; emergency landing, “s” turns and back to Sarasota for three touch and goes and a fourth landing to a full stop. It really was not to bad. I flew the plane decently. Had fun with the maneuvers. The only minor concern was the lack of consistency in the landings; safe but not pretty! 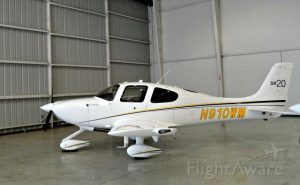 Back to the hotel to pick up Tai and then back to Cirrus to take N52606 for an IFR trip north (again with Dave as instructor) past Tampa to Brooksville. 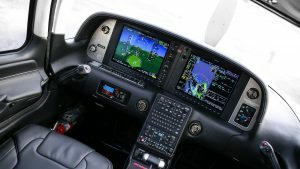 606 is one of the schools Garmin 1000 equipped 172s. It is also air conditioned. Bonus! The weather was that bad to the south that heading north was our only option. 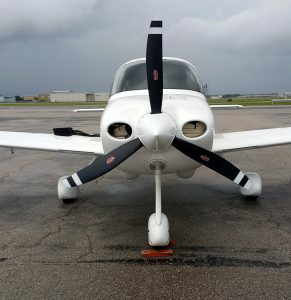 As we went out to prepare the plane the heavens opened – you could see the storm rolling in. So we were about 45 minutes later than planned getting away. 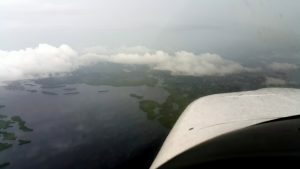 Up the coastline to KBDV and simply cancelled out IFR when we had Brooksville in sight and landed VFR on runway 09. 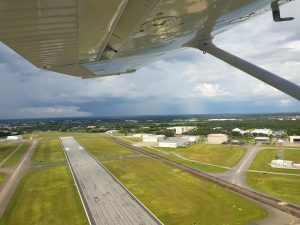 Another delay at Brooksville as there were storms over and around Sarasota. Tai was beginning to wonder why we flew at all and was unimpressed that we may end up stranded there. 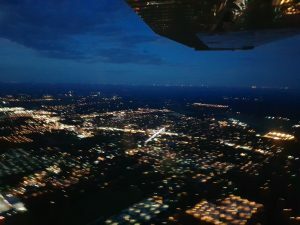 The weather cleared in time and we eventually left, at night – again IFR to Sarasota – flying over Lakeland to the east of Tampa and then to Sarasota. So this was both instrument time night hours and a night landing! Rather than taking radar vectors to Runway 14 we simply flew the approach VFR to runway 22. No PAPI available; no approach lights to guide me in. And the best landing of the week. Tai was taking the pictures fom the rear seat. That was a late night – it was about 9.00pm when we landed. And there was plenty of lightning to watch as we flew; though we avoided most of the precipitation. First day back and 4.2 hours of flight time! 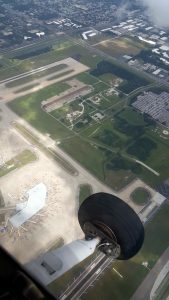 Onto the 24th and IFR cross country again today – via a missed approach flying the RNAV/GPS approach to Avon Park Executive runway 10. 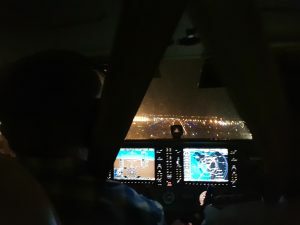 This meant flying the procedure turn at the Initial Approach Fix at OMIGE, announcing our intentions on CTAF as Avon Park is uncontrolled and then flying the missed approach at a decision height of 640 feet. Into the FUPGE hold. 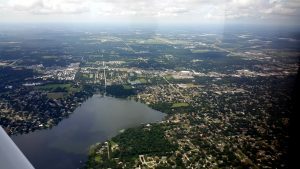 Onto Winter Haven – flying the GPS approach to runway 11 (the runway came up on me a bit quickly – narrow runway – bit of an illusion) where we stopped for lunch. 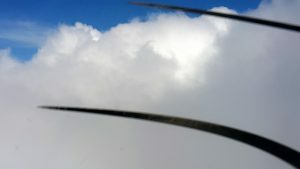 One quick note on flying IFR into an uncontrolled airport – you are not entering the traffic pattern as you would flying VFR. So ATC will tell you when to change frequency to CTAF and then you state your intentions to any traffic in the pattern. Lunch at Gilberts Field/Winter Haven – the restaurant was busy and very welcoming. Always a good sign. I have always liked Winter Haven. It is uncontrolled but not too busy. Though they are adding new taxiways. 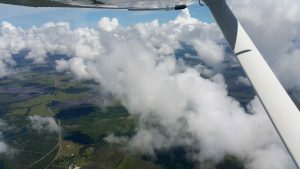 We had filed an IFR flight plan on foreflight for KGIF – and then did the same on the ground for the flight back to Sarasota. The filing process really could not be easier. Back to Sarasota we flew the ILS approach to runway 14. Easy – I know that one quite well now. A similar plan on the 25th with almost four hours of flight time; this time via St Petersberg and onto Bartow. 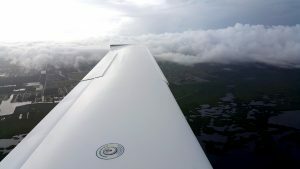 We filed IFR to PIE and then picked up a second clearance at PIE to head east to Bartow. 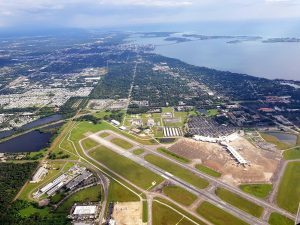 The flight across to Bartow was through some cloud and rain but took us at 3,000 feet directly over the centre of Tampa International Airport. 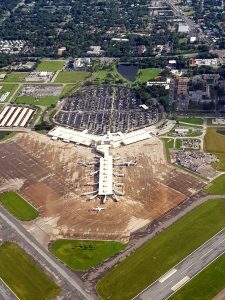 Which sort of makes sense – the runways are 19/1 at Tampa so my flying west to east over the centre meant I was not in anyone’s way! One moment that caught my attention as we climbed away from PIE. We were in cloud. Zero visibility of the ground. Not sure what distracted me. I think it was ATC asking me to advise when we had TPA in sight. Unable we said – as we were in IMC. But the call was a distraction. Suddenly I was 20 degrees off course and in a left turn. It was amazing how quickly I was off course and not staight and level. I corrected it. But it was sloppy flying and shows how easy it is to lose positional awareness in cloud. The good news is that I had kep the speed where I wanted it. It is also a good reason to use the autopilot in IMC. Bartow was good – we flew the GPS onto 9L with the procedure turn at the start of the approach at GUVEQ. Landed and taxied to the ramp. There is a nice little cafe at Bartow – their lobster chowder is recommended. We also spent a few minutes in the museum there. Then we asked ATC if we could fly a few touch and goes. 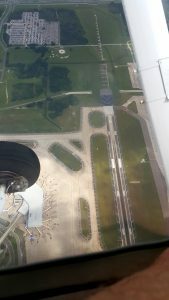 No problem – left on 9L and then a right pattern for landings on 9R. Good practice. 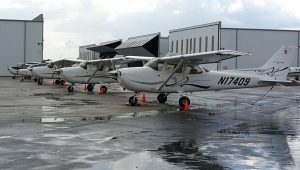 We did get a traffic alert as a Cherokee flew west to east over us – clearly in Bartow Class D airspace but not talking to anyone – tower asked if we saw him. 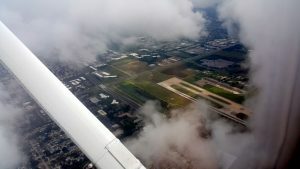 We flew one go around and then a full stop onto 9L to obtain our IFR clearance and fly back to Sarasota. Nice stable approach onto 32 but just flared a little too early so the landing was not great 0 which was a shame as the approach was fine. 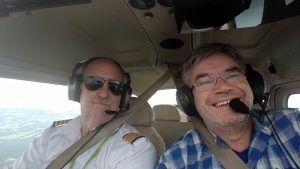 And finally on day 4 my flight with Todd Richless in one of the Lift Aviation Cirrus SR20s. We met early – 7am – which proved to be wise as the weather started to deteriorate rapidly from 10am. 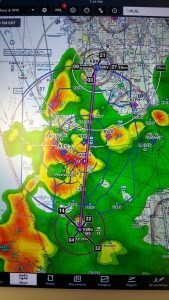 Again we filed on foreflight for an IFR flight to Punta Gorda. 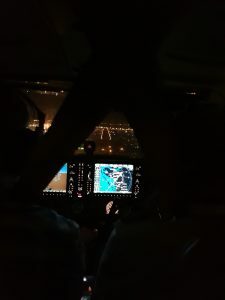 We flew the GPS for 22 at PGD and requested to fly the missed approach and enter the hold. 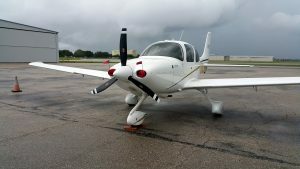 The Cirrus makes a go-around really easy – a go around button does all the work, sets the throttle and engages the published missed approach to BULOW. Though in this case ATC requested we flew the hold at 3,000 feet rather than the 2,000 feet in the published hold. This would keep us out of the worst of the weather. 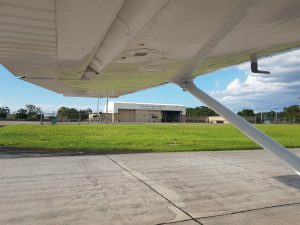 ILS back to runway 32 at Sarasota – where we requested two touch and goes and a third landing to a full stop. 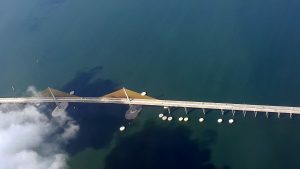 So I flew the first approach on the ILS glidepath and then we flew the SRQ pattern – a right pattern from 32 – as VFR. 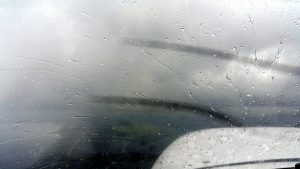 The last landing was just before 10am and the weather was starting to look very miserable. good timing. 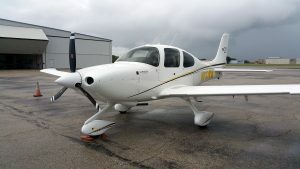 The Cirrus SR 20 is a serious airplane. Beautifully built and finished. It is comfortable; has great visibility; is very stable; and feels like a real airliner. The side stick is very intuitive – and easy to fly if you have flown the 162 Skycatcher. 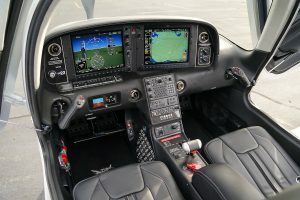 And a picture of N910wm (from flightaware) and a couple of SR20 cockpit pictures taken from online sites – just so that have some feel for the interior and the instrumentation. 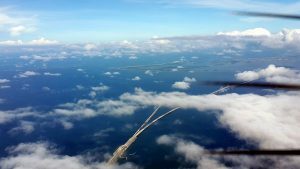 Here is a review of the SR20 in flight – pretty accurate. And the sales pitch from Cirrus Aviation. So four days of flying – 12.9 hours in the log book with 5.1 hours of instrument time and 1.3 hours of night flight. 8 instrument approaches and 18 landings. My bi-annual flight review is also done. It was good to be back in Sarasota. It is a great training airport for ATC work. The August weather is hot, sticky and there are plenty of storms. 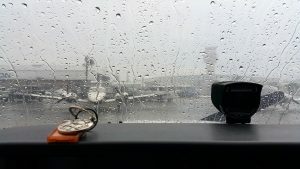 But that also makes for some real OFR flying conditions. 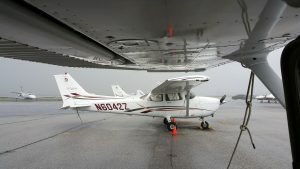 It is worth noting that I could not have flown VFR on any of the days and routes that I flew. Which shows why an instrument rating is so valuable.